We spent over 25 hours researching and testing over 20 different types and styles of teethers and found that safety, effectiveness, and easy to hold on to were the most important factors for consumers shopping for teethers. Nuby Ice Gel Teether Key, 2 Pack scored high marks in all categories and is our overall top pick. These baby teething toys stimulate the gums and massage them with their textured surfaces that will help the teeth break through. They are even more effective when put in the refrigerator before giving them to the baby. These BPA free teether toys have an easy grip design that is perfect for little hands to hold onto. Teething is a really fussy time for little ones and if you’ve ever had a toothache you can understand why. If your baby has swollen gums, is drooling a lot and is unusually fussy, then you can probably blame teething for the symptoms. There are tons of teething toys on the market in all shapes, sizes, and designs. With so many to choose from it can be challenging to figure out which one is the best for your baby. Most parents have several teething toys on hand for their little ones during this difficult and painful time. It is important to make sure that the teething toy you purchase is safe for your baby. We have reviewed three top-rated teethers below that are favorites with new and experienced parents alike. These three teethers are high quality, BPA-free, and provide hours of gum relief for your little one. We have also provided a buying guide that will give you the information you need to understand the difference between teethers and how to determine what the best features are and what to look for when you are shopping around. This information will take the guesswork out of shopping for teethers and make the whole process simple and easy. Nuby is a well-known name in baby toys and products. This two pack of ice gel teethers will provide your little one with soothing relief during teething time. The textured surfaces massage the gums and the bright, cheerful colors stimulate the baby’s senses and give them something to look at and play with. These ice gel teethers are even better when you keep them in the fridge until you give it to your baby. The cold feeling of the teether key against their sore gums will have them feeling much better. Both of these teeth toys are for ages 3 months and up and are BPA free for maximum safety as well as being free of latex, phthalates, and PVC. The easy-to-grip- design is perfect for little hands that are just learning coordination. Nuby has been around since the 70s and is a well-established and trusted name in baby products. If you are looking for the perfect teething toy for your little one you will love this collection of quality teethers from Ike & Leo. These colorful teethers are made from FDA-approved food-grade silicone that is PVC, BPA, and phthalate free. They can be used by babies at any age for soothing the sore gums that are associated with teething. Chewing on any of these teethers will have your baby feeling much better and will help the teeth erupt through the gums with less pain. The design of these teethers allows even the molars to get massaged. Included is a pacifier clip to keep the teether from being dropped onto the floor. Ike & Leo offer customers a 100% satisfaction guarantee that is you are not satisfied for any reason they will give you back every bit of your money. 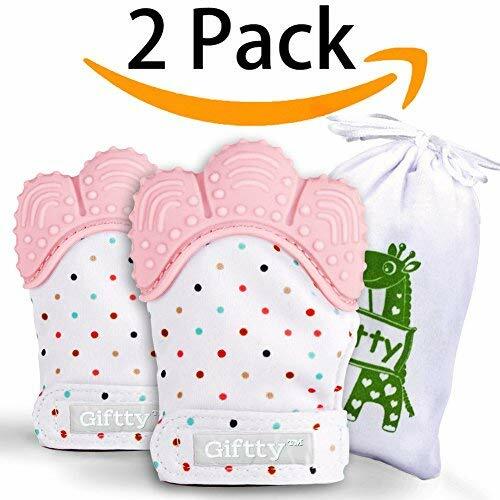 These unique teething mittens are an excellent choice for babies who have started teething. They are made from soft silicone that is BPA-free, food-grade and completely safe for babies of any age. The mitten design fits on the baby’s hands and allows them to soothe themselves by putting their hands, and subsequently the teether toys, in their mouth. The adjustable strap features Velcro and helps the mittens stay on your baby’s hands rather than falling onto the ground. The entertaining crinkle sound keeps your baby’s attention on car rides and other places. One of the many features of the teething mittens that parents love is that they are machine washable and dryable so they are easy to keep clean. They arrive in a hygienic travel bag that is convenient and easy to store in your diaper bag. The breathable fabric used to make the mittens keeps your baby’s hands from getting sweaty. The teething part of these mittens makes them easy for the baby to chew on since they fit easily into the mouth. They will also help reduce the scratches that baby’s easily leave on their own faces from their nails. The three top-rated teethers we have reviewed below are excellent examples of the kind of teethers you want to use for your baby. All three of them are made from premium silicone and breathable fabric. The silicone used is BPA free and is completely safe for the baby to chew on. Each of these quality selections are colorful and designed to be easy for even young babies to hold. Taking the time to be prepared for teething by having the right, quality teething toys on hand will make this difficult time go smoother. You won’t have to go searching for something that works, you’ll already have good teethers on hand, ready to hand your baby when teething time starts. Once you are ready to purchase teethers, consider purchasing one of the three top-rated selections we have reviewed above. Any one of them would be a great place to start. If you do not see what you are looking for in any of the three top-rated teethers, we have added 7 additional selections that you can consider. The process of teething can be a real challenge for babies and parents because of the fussiness and pain it causes. Babies are usually irritable, may cry often, and drool excessively. There are some things you should know about teething to make this process go as smoothly and painlessly as possible. Teething usually starts at around three months of age or a little after. Teeth will not usually rub through the gums until 4-6 months of age but the drooling will start a lot sooner. The molars are a little rougher on your baby than the front and lower teeth and you may notice they tug at their ears a lot when the molars are coming in. There are several things that you will want to avoid when it comes to purchasing teethers. We have listed these things below for your benefit so you understand what is safe and what should be passed over. BPA – In 2013 BPA, otherwise known as Bisphenol-A was banned for use in baby products due to the potential hazards associated with it. It has been thought to be a disruptor of the endocrine system. Phthalates – These chemicals are added to plastic to make it bendable and more flexible. These chemicals can leach out over time into the baby’s mouth or liquid that is in the baby’s bottle or cup. PVC – Polyvinyl chloride or PVC is a very toxic chemical that you don’t want around your baby’s mouth. Teething necklaces – Teething necklaces can be dangerous for obvious reasons and should not be used. Anything that goes around the baby’s neck is an immediate strangulation hazard and should be avoided. Teething tablets – Teething tablets are very dangerous and should never be used. The FDA found that a popular brand of teething tablet contains high levels of beladonna which has been shown to have effects on young children that can be life-threatening. These tablets can potentially cause breathing difficulties, muscle weakness, sleepiness, flushed skin, seizures, no energy at all, problems urinating, and constipation. Teething tablets are not the same thing as infant pain reliever or baby orajel that is designed for teething pain. If your baby isn’t feeling well from teething you can give them the doctor recommended dosage of a baby pain reliever or baby orajel. The teething toys are designed to expedite the process of the teeth coming through by numbing the gums. 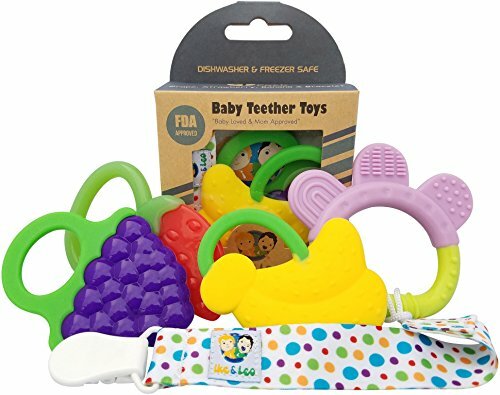 Teethers made in China – as much as 85% of all toys are made in China so avoiding China-made products completely can be really difficult but teethers are a different story and should be avoided completely. Chinese teethers can contain lead and the plastic Chinese teethers will more than likely contain phthalates. Teething biscuits – Teething biscuits have been around a long time but they are best avoided if you want to be as safe as possible. Teething biscuits can soften and even break apart into chunks in your baby’s mouth once they get chewed on for a bit. Boiling or sterilizing your teethers – It is not recommended to boil your baby’s teethers or place them in a sterilizer due to weakening the materials that they are made with. Washing them in warm soapy water and rinsing thoroughly or washing in the dishwasher if possible are methods that are safe and acceptable for getting the baby’s teething toys clean. If safety is the foremost thing in your mind and you are not comfortable with the plastic and silicone choices on the market, a teether made of wood and natural fabrics is your best choice. There are several wood teething toys to choose from and they are becoming more and more popular as people look for safer items for their babies. Unfortunately not all babies like wooden teethers but if they are not offered anything else they will probably get to like them with no problem especially if the shape is easy to hold and pleasing for the baby to look at. You should ONLY purchase a wooden teething toy from a reputable, long-established company with a solid reputation to avoid getting a hole of wooden teethers that splinter or crack. Make sure that any wooden teething toys you look at and consider are free of any lead-based paint and any other type of chemical coating that can be harmful. Make sure that there are no sharp pieces, splinters, chips or cracks in the wooden teethers you give your child. When it comes to purchasing teethers the main things that parents focus on is safety and effectiveness of the teether. Since your baby is going to have the teething toy in their mouths safety should be top priority. We have provided information on things you need to watch for when you are shopping for the right teething toy for your baby. Easy-to-hold style – If the teether is hard to hold or bulky for your baby’s little hands they will not have an easy time and the teether will not be very effective. If the baby keeps dropping the teething toy it isn’t going to be very much help at all. Many of these toys have small “handles” that correlate with the shape that makes hanging onto the toy much easier. There is also pacifier-style clips that some teething toys come with that will allow you to clip the teething toy to the baby’s onesie or other clothing and prevent it from being dropped or tossed onto the floor. Liquid-filled or gel-filled – Parents love the teethers that are placed in the fridge until they are cold and then given to the babies. These are highly popular choices when it comes to teething toys if you decide this type is just right for your child, be certain to look for holes or cracks each time before you give it to your baby. *note – pediatricians don’t recommend putting gel teethers in the freezing because they get too hard and then can cut the baby’s mouth or gums. Silicone teething toys will not usually get hard in the freezer. Easy to clean – Look for teething toys that you can keep clean easily and wash carefully so they are free from potentially harmful bacteria. Clean the teether after every use. Some teethers can be washed in the dishwasher which offers an exceptional cleaning that hand washing doesn’t always provide. Visually appealing – Babies love bright colors and sounds so finding a teething toy that has a lot of engaging colors is not difficult. Most of the teethers on the market are made in a variety of brilliant colors that will grab your baby’s attention. Designs are huge when it comes to teething toys as well. They come in a large variety of designs from fruit shaped teethers to animal shapes or even teething mittens. Pinchy parts – One thing that many parents overlook when it comes to teethers is the parts of the teething toy that can pinch the baby’s tongue or lip. Teethers should be single in design and while they can be colorful and textured but the styles that are one continuous piece are much safer for the baby to chew on than those that have loose rings that slide and other moveable parts. The best teething toy for your baby is going to depend largely on the preferences of your baby. If you offer them early enough most babies will get used to them and have one or two favorites that they pick out from the collection you offer. There are many ways to soothe sore gums from teething. A lot of the new teething toys on market are very simple in design rather than a menagerie of rings and balls like they were years ago. Some babies will prefer something like the mitten teethers that they can wear on their hands while others will love the chilled teethers that are usually in various fruit or veggie shapes. The primary goal is to find the safest and most effective teethers you can find and have several on hand for your baby to use during this difficult teething time. The three top-rated teethers we have reviewed up above are all high quality teethers that illustrate the various styles that are available. If you want a fast solution to your baby’s teething needs any one of these featured teethers will do the trick and are safe and effective to boot. The information you have gotten in this guide will help you avoid anything dangerous in a teether such as the wrong materials. You’ve also learned about what to look for in a teether that will make it something that soothes your baby and makes teething time much easier. The right information and knowledge, such as what you have gotten from this guide and the reviews, will help you make a confident decision about your baby’s teethers that will provide them with a safe, reliable way to ease the pain of new teeth.